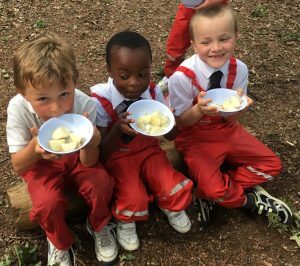 We have had a super exciting week – starting with the harvesting of our potatoes on Monday! Mrs Lock’s class Rocket potatoes were 1965g in weight and Mrs Blacker’s Rudolf potatoes were 1930g. So Mrs Lock’s class won the heaviest crop competition, however Mrs Blacker’s class grew the heaviest individual potato weighing in at a healthy 40g! ….So we are all happy! Can you see why they are called Rudolph potatoes? 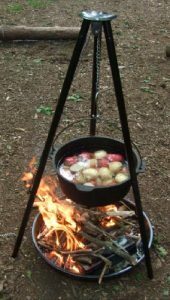 We all went into the woods with Mrs Jenkins on Tuesday afternoon and we cooked our potatoes in a Dutch oven – they took considerably longer than we expected for them to cook, but we passed some of the time by building with the tree trunks, taking turns on the outdoor swing and singing campfire songs led by Mrs Lock! We think we were in the best place – out of the sun and in the shady woods!